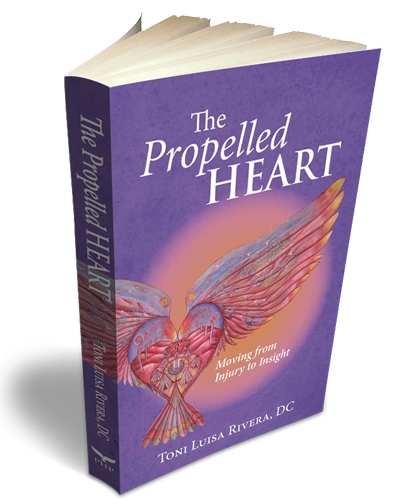 This book, The Propelled Heart: Moving from Injury to Insight, finally came into being as the encouragement of others ripened into a definite resolve to follow through. Dr. Toni has many entertaining stories from her event filled life and people have always encouraged her to share them. Family, friends, clients and workshop students over the years have suggested that she write about what she has learned in her thirty years of private practice, using stories from her life to illustrate the main points. As she began to write this book, the heart of the story that wanted to be told was one she had never intended to share with the world. This book emerged from the depths of Toni’s soul. The story that wanted and needed to be told, before any other book could be written, had to include the childhood sexual abuse she had been subjected to at a very early age. The memories began to emerge as she delved deeper into the study of the body/mind connection in the Rubenfeld Synergy Method Training. Part I: Injury to Impasse, is a memoir about the journey from injury to success as a Doctor of Chiropractic and Rubenfeld Synergist. 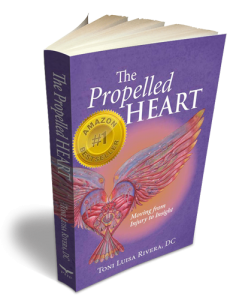 Part II: Impasse to Insight, shares topics that the author feels are vital to personal healing on all levels of Being. The physical, mental, emotional and spiritual aspects of being human are intertwined and interacting constantly in our daily lives. There are times we may feel at an impasse. Unable to change some habitual pattern of thinking or behaving. Included in this section are simple, yet profound exercises that allow the reader to explore their own physical, mental and emotional patterns. Sign up for the free newsletter to receive audio downloads of exercises from the book. 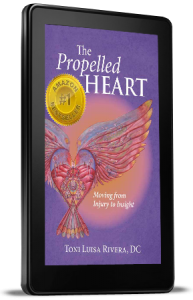 Sign up to receive both a FREE Chapter and FREE MP3's of Dr.Toni leading you in body/mind exercises from the new book “The Propelled Heart”.